....is the nicest guy in the DC Universe. 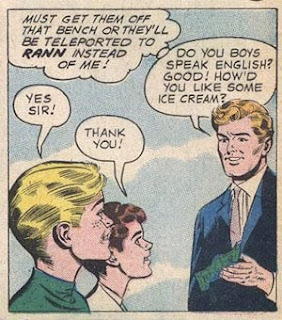 1959: When strange men could buy little boys ice cream with impunity. Honestly, what other superhero would buy a complete stranger ice cream? Batman? Yeah, didn't think so. Adam Strange, you creepy guy...Was this before they made those videos warning kids about guys like Adam? Yes. He has a whole van full of candy, too but I decided not to post that panel.